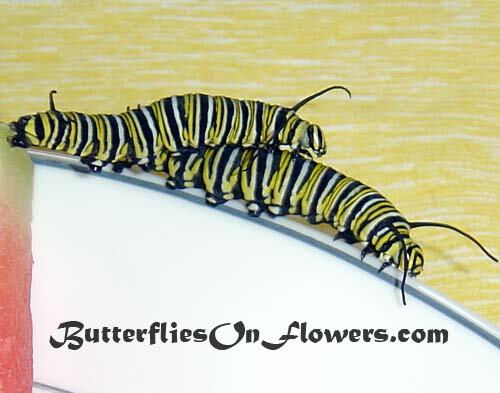 Caption: 2 monarch caterpillars ride piggyback along a dinner plate picture. Over the years, I have tried to capture monarch larva interacting, but they seem to prefer the lonely hermit lifestyle. When two cats touch, they violently whip their heads and bodies about like an 80's hair band and head off in opposite directions. Sometimes when they're overcrowded, they unintentionally interact and hilarity ensues. I think the above moment could likely be explained by the caterpillars less than 20/20 vision...or maybe this playful monarch likes joy riding...yeehaw!! Camera: Old Canon digital camera. Caterpillar Facts: Caterpillars have poor vision. They see through 6 pairs of simple eyes called ocelli.